Corporate eLearning Strategies and Development: OFF TOPIC: MOO totally gets design! OFF TOPIC: MOO totally gets design! 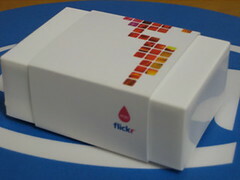 I posted a couple weeks ago about a small UK printing company taking advantage of flickr's open API called MOO. My little package arrived yesterday just in time for the DevLearn2006 conference. 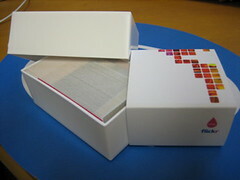 They arrived in the coolest little packaging: Plastic instead of the usual cardboard. They even included a little return label in case there is anything wrong with the order. Mine look great so I won't be needing that, but what great touch of customer service. Simplicity, Clarity, Grace, Beauty - MOO nails them all. From there amazing interface, which starts the experience, right up until you get to hold that cool little box. MOO definitely gets my "Amazing Design" award. Not that it means anything coming from me, but I just love this kind of buying experience. I would buy more stuff from more people online if only they could figure out what MOO has figured out. I didn't know that I even needed these little guys until I was introduced to them. 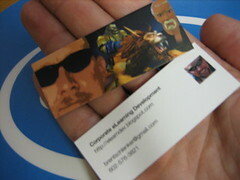 Now I'll never buy 1000 business cards ever again. 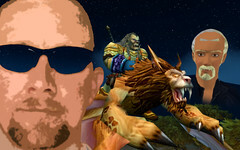 I'll just make up some custom miniMOOs from my flickr account for each event. Oh, and I forgot to mention that I don't think I even did the experience the way it was intended. You can actually use as many of your flickr images as you want and they will divide them amongst the hundred evenly: So you can create a flickr folder of 10 images and buy the 100 pack with 10 cards of each picture...I love that. I'll use more pictures next time. Very cool dude!! I love these things!! Mine just came today . . . love them and will be ordering lots more.